Strive to hit straight drives close to the side wall and cross courts wide, to land behind the service box, preferably angling towards the side wall nick. Approach the ball to the side, not behind it. Strive to be about a racket length to the side of the ball to allow for the swing. Early racket preparation will help in judging the distance the body should be from the ball when approaching, and prior to striking the ball. When approaching the ball for a drive, head for a point to one side of where the anticipated stroke will occur. Do not head straight for the ball as you will end up too close. As you near the ball, prepare the racket getting into the shape position. Ghosting is one of the most successful ways to practice footwork. Place, say 4 balls stationary on the court (2 at the front and 2 at the back), position yourself in the centre of the court, and visualise moving to recover a shot where the stationary balls arepositioned. 1. Step towards the ball taking long fluent strides. 2. Check that the body feels balanced - then adjust, and repeat. Minimise the number of steps, and no shuffling around. 3. Now pick up the racket, visualise the path of the shot, follow the pathway to the ball sitting on the racket, but this time also make certain the shoulders, and backswing is in position, adjust, balanced stance, and swing. 4. Once that footwork and swing is reasonable satisfactory, repeat, except taking a pathway to a ball in the opposite corner of the court. 5. Repeat the above method a few times and progress to the swing. Now, combine the footwork necessary to travel between those two ball positions (imaginary shots within a rally). Check for fluent movement, balance, and recovery off the ball/s (moving back through the centre of the court). Then, as above, use the racket and get the feet and backswing into position as if to return a ball from either of these positions alternately. Progress to naming the strokes being attempted, eg from the front a lob, and from the back a boast. Vary the combination of alternate swings. Then, add a third ball into the ghosting movement, as described above. Tries to deceive the opponent. The footwork, giving room for the ball to come off the wall. The energy in the swing, since the boast is moving at an angle off the side wall, not giving any power or momentum to work with. At all times the legs are flexed allowing for longer strides, and being able to get down lower to the ball. lob, drop, boast or cross court. When recovering shots from the back corner it is necessary to get the racket open, to get the lift, and have the racket swing parallel to the wall to bring the ball directly down the wall to length. Backhand Drive recovery footwork and movement - view the split step, as well as stroking off the preferred and non-preferred foot. At a high level of play it is considered necessary to be able to recover the ball using the preferred or non-preferred foot. No matter what foot leads into the shot notice the racket work remains constant. Open or closed stance is not necessarily a bad thing. The important thing is to be balanced at the time of striking the ball which will then help control the shot. 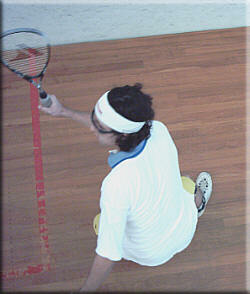 In this video the open/closed stance can be seen to deceive the opponent and disguise the shot being played. Keep at least one racket length from the line of the ball. Come in behind and about one racket length to the side of the anticipated hitting position by placing the back foot almost a metre behind the anticipated striking point. As the back foot goes down, the racket should be fully prepared to commence the stroke. You have established the Shape position. 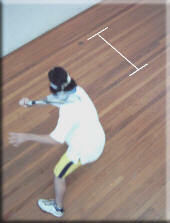 The front foot is taken forward to be about a racket length to the side and in line with the striking point. Experienced players can give false clues. How? Changing the angle of the wrist. Got to the ball early, WAITED - before playing my shot Kept running and hitting until my opponent made an error. Concentrated at training on what shot options would be possible from the front of the court. Hit cross court each time I got to the front of the court. Built up an armoury of replies to a drop shot, eg drop, lob, tickle boast. Try to drive all drop shots to length. Waited till my opponent moved, then hit the ball back to whence they came. Tried to out hit/run my opponent. Position the body in a way that makes it difficult for the opponent to take off until you have struck the ball Squeeze around my opponent so I can get a good shot at the ball and mess up the shot. "Set" with the backswing just prior to the stroke. Transfer weight as the downswing commences (the hit). Keep the procedure as fluent as possible. As the front foot starts to come down the backswing commences taking the player into the Set position. Depending how early the player is for the shot, the set position soon makes way for the hit as the weight of the body transfers from the back to the front foot and the downswing commences. Ensure that there is plenty of room to take a full swing at the ball (usually a racket length between the player and the line of the ball. 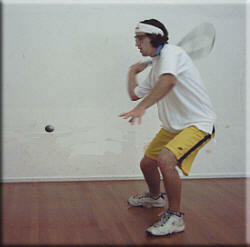 Start the racket off on the line of the ball if possible and swing through to the target point. Movement while striking the ball can alter the accuracy of the shot, but increase the power of the shot. Forward movement while striking the ball will make it more difficult to recover to the centre of the court after hitting the ball. (Often causing one unnecessary forward step). Weight transfer can get players into trouble if the feet are not balanced. It is necessary to have a wide base of support to steady the feet. If the feet tend to move with the transfer of weight that can make the shot inaccurate, as it pulls the swing out of alignment from the target point, resulting in a lack of balance, which then hinders recovery. Lifting of the head at the time of striking the ball can prevent weight transfer. Moving off the ball before finishing the follow through can alter the direction of the hit and power of the shot.. Standing almost cross-legged when attempting to recover to the center court, will hinder the speed of recovery, and prevent smooth movement back to the center court. Check that balance is maintained on both the front and back foot (test that out by attempting to swing while having the weight on either leg). This is particularly helpful when the ball juts out quickly or unexpectedly hits the nick. It is important to be able to step back towards the center court after striking the ball, as opposed to taking a step forward, then turning around, and moving back. In the video back wall rail drive you will see the movement and judgement required to strike the ball accurately, and then regain balance as well as recover to the center court. Follow through to the target. Finish follow through near ready position for next return. 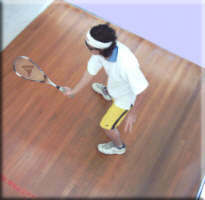 Immediately after racket ball impact, the player should start the process of recovery to the T.
Throughout the striking process the player should remain balanced and this must be maintained as the backswing is completed and recovery is commenced. Ideally, the follow through should finish not far from the ready position for the next return. Striking the ball when moving into the back corner, and speedy recovery to the center court. While recovering to the T (centre court area) keep watching the position of the opponent. Be "Ready" to volley or intercept the ball while the opponent is returning to the "T". Balanced movement and racket ready. PU Grip - do they expire? which do you prefer? firmer or softer grip? Excuse my sentimental mood,but that´s the way I feel it. Your work makes a sense.